June 17, 2014 · by Zack Reyes · Post may contain affiliate links. See my disclosure policy here. I've seen Cascade coupons in a number of places in the recent months. 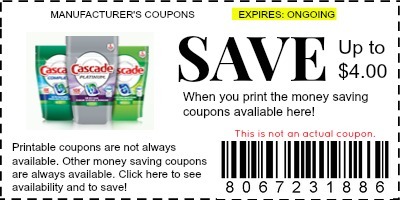 Online, newspaper inserts and on products are just a few places that I have found Cascade coupons. Cascade coupons are nice because generally speaking, Cascade is not cheap as far as dishwasher detergent goes. Using coupons on top of store promotions and sales can really help to bring the cost of Cascade products down to a more attainable level. Many of the recent Cascade coupons have been for their Action Pacs. If you go to most stores now, you'll actually only find these action pacs and might not find the classic box of detergent. Cascade actually has a section on their site for Cascade coupons, although at this time, there are no coupons available when you click that section. Click here to see if there are Cascade, or other laundry coupons available to print right from this site! If you're really looking to maximize your savings, with for a drugstore like CVS or Rite Aid to put Cascade products on a store promo where they give you $5 or $10 store credits for purchasing a certain dollar amount of Cascade or other participating products. Use coupons on top of those store promotions and you can really get the cost down. We also occasionally see Target store coupons for Cascade. This is sort of the same idea as the above. The Target Cascade coupons can sometimes be found online at Target's site and sometimes in the newspaper inserts. As with any coupons, when you see printable coupons for Cascade online, be sure to print the as soon as you can, and print as many as you can! That way, when a sale or promotion comes around requiring you to purchase multiple packages, you are armed with enough coupons to use on each item you are purchasing! 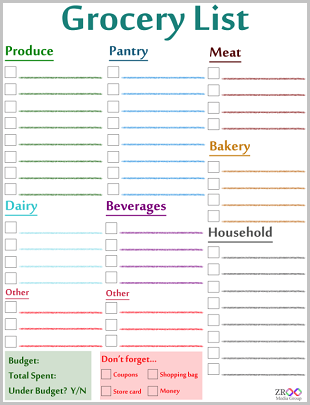 You can find printable grocery coupons right below this post!